And I was a sobbing mess by the end of the film. Truly, his life is something that should be celebrated, and I am glad this documentary is there for people to see, and I am elated that this is a hit, and everyone is watching it. Basically, the film tracks him and how he started his show from nothing but just his vision and talent. Compared to what kids are watching nowadays. the show defines ‘simple,’ but as well know, in simplicity is clearness of message – and he just wanted to spread his brand of acceptance and love. And of course, as we can see in the documentary, Republicans hated him because they didn’t like that he was giving that message that everyone should be special as they are – they were picketing his funeral, even. The one thing I got from this is his message will never go out of style and in this crazy combative divided world we live in now, we can all use a little bit of what he is preaching. I think everyone should see this film, and not just watch it, but understand and internalize his message. I bet the world will be a more peaceful place. Did you know that more than 50 percent of Americans are single? That factoid is provided for us at the very beginning of Jonathan Cipiti’s documentary ‘The Dating Project,’ which tackles dating in this modern age of online apps and social media. I watch this with just a little bit of curiosity. Someone like me who is in my fifties surely can no longer be bothered, right? I wish I learned something more, but we just get here the depressive facts that dating is just as difficult, just as complicated. The film follows five individuals but sad to say, they aren’t really more interesting than your average contestant in reality dating shows. And the most interesting parts for me – the actual dating – did not happen until the very end of the film, which kind of defeats the whole purpose of the film. Twenty years ago, Jon Benet Ramsey died. And even though two decades has passed, the case is still unsolved, and on its twentieth anniversary, there are a slew of ‘specials’ dedicated to the murder. I saw ‘Jon Benét – An American Murder Mystery’ from the Investigation Discover Channel, which I guess is an offshoot of the Discovery Channel. This three part series is very comprehensive, but I don’t know if I learned anything new from it. The main point of the documentary seems to be that after reviewing the facts, people tend to be polarized, and are divided into two groups – those who believe that her parents had something to do with it, and those who think otherwise. Lump me with the first group. I don’t know why – and this is just more gut instinct – but something is off there somewhere, and apparently a grand jury had recommended that John and Patsy Ramsey be charged, but the district attorney was against it, and some key people are saying that it is because the Ramseys have gone friendly with her. Not on this special is the ‘revelation’ that when Patsy placed the 911 call, she thought she had already hung up and was asking two other people “Now what?” This bit of information seems to have come from the CBS special tackling the same subject (Actually, I thought this special had that info, and was the driving factor behind me watching this) I think it is bewildering that this case has never been solved over the years, and a lot of that stems from the fact that Boulder police made a lot of mistake when they were first conducting the investigation. i wish I could say that this three part series was riveting, but it was not. I felt a lot of it was padded, and I almost stopped watching. Maybe I should have researched more and watched the CBS one. Didn’t I just write about a movie about a politician with the zipper problem? I think I just saw the documentary about the guy with the biggest zipper problem of them all: Anthony D. Wiener. ‘Weiner,’ a film by Josh Kriegman and Elyse Steinberg documents Weiner’s failed 2013 mayoral run. It starts after Wiener has resigned from Congress because of a sexting scandal. He then tries a run for Mayor of New York City, and that seems to be the best idea – because he does have an overflow of charisma, and as a politician, has bright ideas. And yes, I do agree with his politics, so he is aces in my book, in that regard. But wiener s will always be wieners, and in the middle of his campaign, more of the zipper problem surfaces: photos of his member, and extraneous activities under the guise of one Carlos Danger. We have all seen it, we have all joked about it, ha ha ha. This sinks him, and his campaign, with him landing in last place. It is a fascinating watch, and this definitely makes us think. I myself have not been happy with how Bill De Blasio has performed as Mayor, and this really made me wonder – what if, what if, what if? Wiener seems to still be ticking, and is still doing the pundit circles defending the Democratic party. And we go back to the aged old question of – do the private lives of these candidates really matter? “I lied to the people,” Wiener muses toards the end of the campaign, and ultimately, that really was teh crux of his demise. But again, I still wonder what if, what if, what if. Anyone who knows me well knows that I am a big collector of music. And I was a collector of compact discs. I have thousands of them, and I still consider it my life long goal to digitalize them. I remember that I was such an obsessive CD collector that I would spend my weekends scouring through bins at various used CD stores in New York City, from East Village to Midtown. I knew all the spots – most of the people who worked at these stores knew me, and there cam a point they would put aside titles they think I would like. I was a rabid fan of jazz vocals, and you should only take a cursory glance at my music thoughts here to see I still listen to them. So of course I would be so interested in Colin Hanks’ documentary about the rise (and demise) of Tower Records, a store that I visited so frequently I could close my eyes and still imagine every nook and cranny of two of my favorite branches – The one on Broadway and 4th, and the one on Columbus Avenue. And the documentary did not disappoint. it tells the story of the store from the very beginning – when Russ Solomon started the store as an offshoot of his father’s drugstore, and called it Tower Record Mart. And it skyrocketed to one of the biggest stores, if not the epitome of the ultimate record store. It was a billion dollar business in 1999, and the documentary points out the five years later it went bankrupt. It’s all very sad, and the film feels like a part of my life that’s ended. i cannot help but agree with Elton John as he laments in the documentary: “When the doors closed, I feel like part of my life ended.” But, everything must change, and there’s still music in my life, only no more Tower. What is that saying? Every pot has a lid? Well, that’s certainly true in some cases, and in others, not so much. In Matt Fuller’s documentary, “Autism In Love,” he centers on a couple of autistic people in different places in the spectrum, and show us how they – just like anyone and everyone in the world – look and find love in the world. It’s sort of an eye-opener for me. One of the mothers of these special people even said she never thought her son would ever find love, and there he is, partnered. There’s Lindsey and Dave, who met at an autism conference and is now living together. They talk about all the adjustments they make in their lives to make their relationship work, and their story is framed in a rom-com angle. Their happily ever after? He proposes to her at the end of the documentary. Some of the other stories aren’t nearly as cheerful. Lenny is so classic male chauvinist, and is unrelenting on his quest to find a girl who has to make less money than he does, so that he becomes the ‘main provider’ for their family. And there’s Stephen, who is married to Geeta, but she has been battling cancer, though still upbeat. Does he provide her the emotional support needed in her condition? I doubt it, but what do I know as she seems happy. But overall, it made me think. People are people, even if they are on the spectrum. They look for love, and some are more successful than others. Just like us, just like me. I found myself watching back to back two documentaries about the process of making art. “Dior and I” chronicles Raf Simons as he prepares his first collection for Dior. He replaces John Galliano after the later was fired from the fashion house, so there is a lot of pressure for Simons to perform: he is an underdog choice for the brand, as he is known for his work in menswear and for his minimalist style while working for Jil Sander (He dispels that accusation) Moreover, he has to finish his collection in two months, whereas normally a designer has at least six months to prepare. We see the creative process here, and the result is a mixture of an expanded Project Runway episode and a commercial for the house itself. 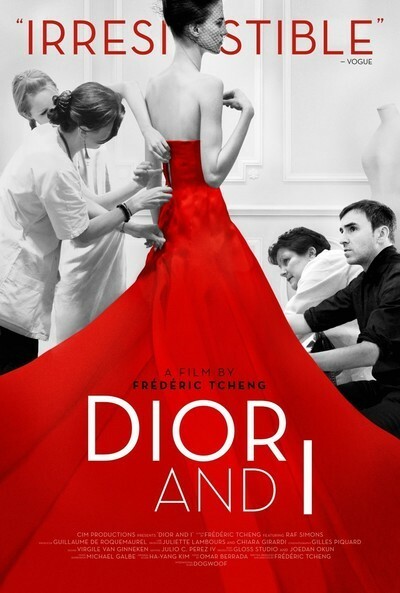 Frederic Tscheng is no stranger to fashion documentaries, as he was involved previously in ones about Diana Vreeland and Valentino, so he knows what he is doing here. He documents all the drama, and as we get closer to reckoning day, we feel the tension and suspense, even though I remember reading Cathryn Horn’s New York Times rave at the time of the show, so it’s not like the outcome is a surprise to me. When I finally saw the dresses on the runway, I found myself weeping – I know, I’m dramatic – because of the sheer beauty of them, and the work and love that went into these creations. “Ballet 422” is a lot more subtle. Director Jody Ann Lipes documents the proceedings here cinema verité style – there are no talking heads or narrations here. 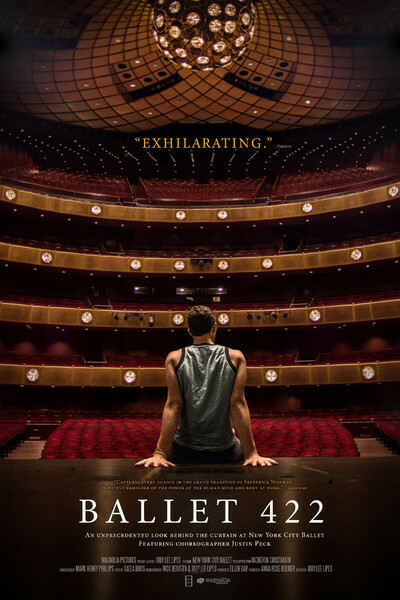 We see exactly how Justin Peck creates the 422nd ballet of The New York CIty Ballet. He is the youngest choreographer commissioned to create one, and at the same time he is still a member of the company’s corps de ballet (sort of like a chorus member if this was a Broadway show) We see the creative process here more subtly. Just like ballet as an art it is more refined, and the most conflict we get is when one of the principal dancers has to try three times to get a specific move. This doesn’t make the whole process less emotional, as we still get to go along the creative process. And there’s a sweet irony towards the end when, after taking a bow for his work as a choreographer, he takes off his suit and changes into his costume and dances a part of the company for a piece after showcasing his work. It’s poignant, and touching and while it was never shown, Peck gets the ultimate silver lining: he was promoted to soloist for the ballet company. An arresting piece of work all around, this film.